Public transport or traveling by bike are the most practical and convenient ways of getting to Rock Werchter. Each festival ticket entitles you to a free ticket for public transport (train and festival shuttle bus) to and from Rock Werchter. You can either travel to the festival via the train station of Leuven, or via the train station of Aarschot. The train ticket can be downloaded from sncb.be/rockwerchter using your unique SNCB code you'll be able to download on www.ticketmaster.be/rw from 5 June 2019. The De Lijn bus company runs a shuttle service between the Leuven and Aarschot railway stations and the festival site. The stop for the bus arriving from Leuven is located in zone A. The bus arriving from Aarschot halts in zone C. The festival site is located within walking distance of both stops. A single ride takes about 15 minutes. Line 1 (Leuven - stop Wijgmaalsesteenweg - Leuven): use this line if you're travelling to the festival park, The Hive, The Hive My Space, The Hive Resort or The Hive ADL. The Hive is located right next to this bus stop. For those not camping in Werchter, this stop is recommended as well. Line 2 (Aarschot - Werchter village - Aarschot): use this line if you're travelling to zone C or campsite A1. Only those in possession of a valid e-train ticket or people living in Aarschot can take the bus in Aarschot. After the end of every festival day, a shuttle bus runs from the Leuven train station to Brussels. This bus will halt at the Brussels North, Brussels Central and Brussels South (Midi) railway stations. The shuttle bus leaves every night, about 1,5 hours after the end of the last performance, at De Lijn platform 2 in Leuven. That is just a few steps away from the bus stop where the festival shuttle bus from Werchter drops you off. One ticket, for one one-way ride to Brussels, costs €18. Tickets will be available through Ticketmaster soon. Get yours in time. The number of tickets to this special shuttle service to Brussels is limited. Be green, be healthy and come to Werchter by bike! You'll be here in a heartbeat. You can park your bike nearby and you'll get home quickly afterwards. KBC Bicycle parking area A - located near The Hive. KBC Bicycle parking area B - located on the Provinciebaan to Rotselaar. KBC Bicycle parking area C - located near the bridge of Werchter. Cycle parking is free of charge. The cycle parks will be under constant surveillance. In the cycle parks, a (limited) number of spaces will be provided for mopeds. A cycle repair point will be provided at the cycle parks. For a small fee, you can have a punctured tyre or broken brake cable repaired. You would like to bike to Werchter, but the distance is a bit too large? Choose park & bike! Bring your bicycle in/on the car and park your car on one of the free parksites located a bit further away from the festival. Continue your journey by bike and park your bicycle on one of the supervised bicycle parks near the festival. Drivers are recommended to take the more direct route to the festival from their point of departure. This will help spread the arrivals and departures and cause fewer traffic queues. Important: trust the road signs and switch off your sat nav. In the vicinity of the festival ground there are about ten car parks, divided into 3 zones (A, B and C). If you're not staying on one of the campsites in Werchter, follow the highway signposting to the nearest available parking space. The signposting will be updated continuously. If the parksites in a specific zone are full, you'll be directed to another parksite in a different zone. Please keep an eye on the signposting by the road. From parksite C16, you can take the free festival shuttle that takes you to the festival site. The shuttle bus is going back and forth between the parksite and the festival site continuously. All parksites, with the exception of The Hive parking, are run by local associations or private individuals. For security related reasons, no cars, trailers and other vehicles are allowed on the campsites. Wild camping – including camping on parksites – is strictly forbidden by law. Parking your car costs 20 euro (from Wednesday 26 June) or 15 euro (from Thursday 27 June), regardsless of the duration. The parking fee is to be paid on the spot, in cash. The parking ticket you'll receive is your proof of payment and should be placed behind your windshield. Tip: are you using the car to drive back and forth to/from the festival? Please note the parking fee is to be paid every time you access the parksite. We recommend using other - more sustainable - methods of transportation, such as public transport, park & bike, etc. Better for your wallet and the environment. Win-win. Parking your motorcycle, scooter or moped is possible on the The Hive (North) or B2 parksites. A parking ticket costs 10 euros, to be paid on the spot, in cash. Please note: you will be given a bracelet as a proof of payment. Want to avoid traffic jams near the festival? Have yourself dropped off and picked up at the Leuven train station. At P1 Parksite (Martelarenlaan, Leuven), you can park for free for 30 minutes. A free shuttle bus will take you to the festival. 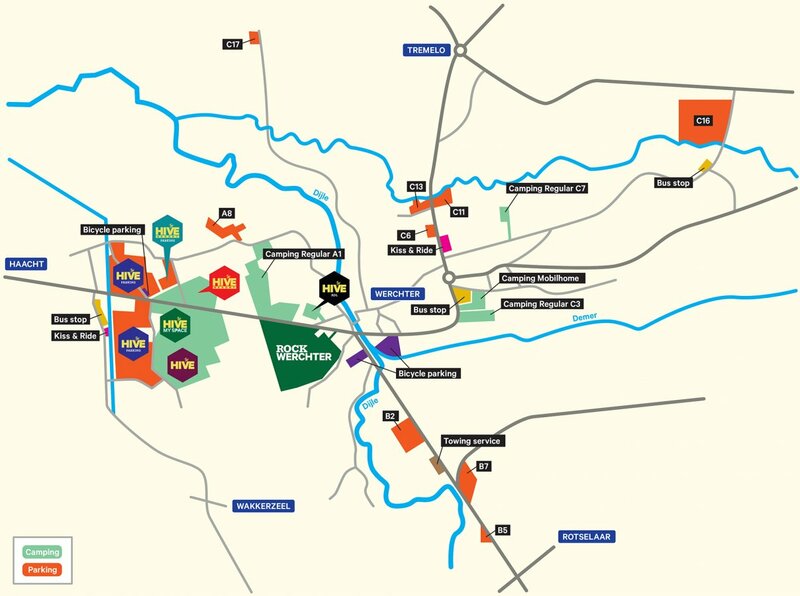 For those living in the vicinity of the festival, a few kiss & ride zones are located nearby. Follow the signposting 'kiss & ride'. You can only stop for a quick load-in or load-out. Parking on the kiss & ride zone is not allowed. Please keep in mind the roads to the kiss & ride zones might be congested! If you're heading for Werchter with your own coach, we recommend you to sign up via werchter@sceltamobility.be. You will receive detailed directions and your parking space for the coach will be reserved. Belgium is easily reached by airplane. From Brussels Airport (BRU), direct trains go to Leuven. Also from Charleroi Airport (CRL), Leuven is easily reached by train. More info on www.brusselsairport.be and www.charleroi-airport.com​​​​​​​.